Who Will Win The Match Today of SRH vs CSK 33rd Match Indian Premier League 2019? 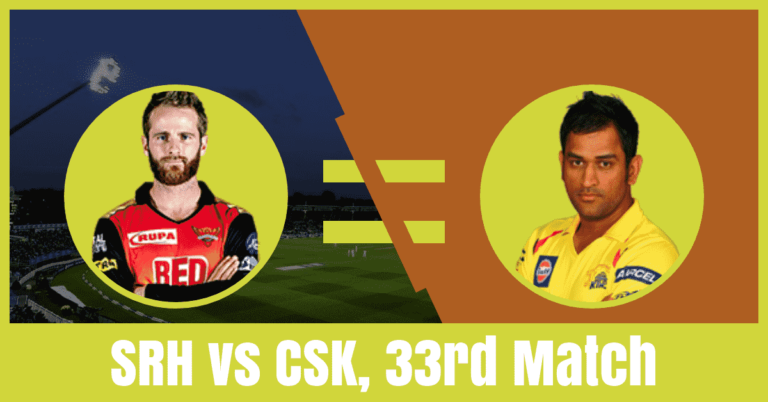 Can Rashid Khan magic stop Chennai Super Kings from winning their eighth match? Sunrisers Hyderabad is all set to take on Chennai Super Kings on Wednesday, April 17, 2019, at Rajiv Gandhi International Stadium, Hyderabad. Read the complete story to know who will win today? The defending champion of last season of Indian Premier League had a great start this season. 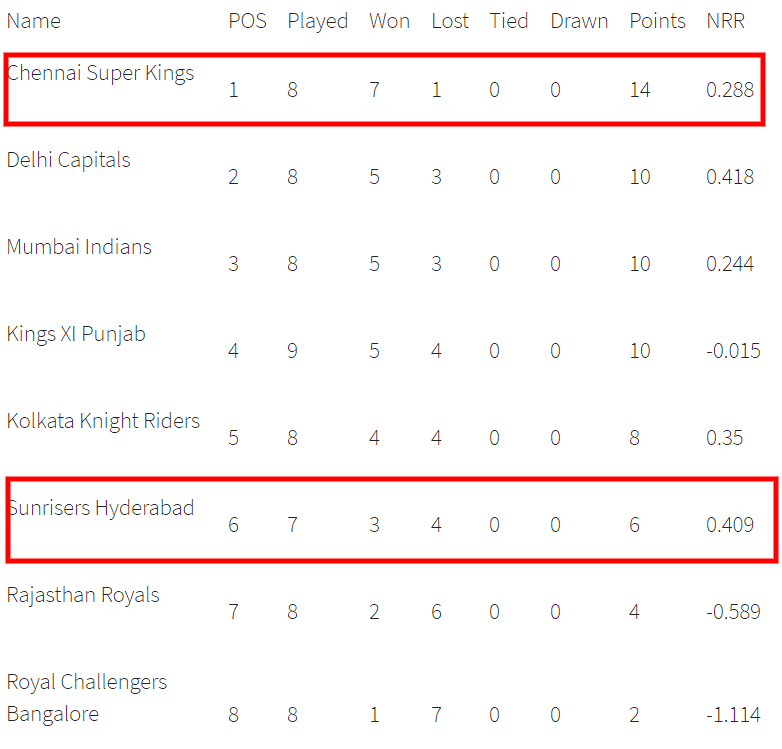 Chennai Super Kings have played 8 matches, won seven and lost one game. They are in the first position of the points table with 14 points in the pocket. They have won their last four matches back to back. They have won their last match against KKR by five wickets. Prior to that, they have won against RR by four wickets and won against KKR by seven wickets. MS Dhoni, Suresh Raina, Ambati Rayudu, Kedar Jadhav, Faf du Plessis and Shane Watson are the top scorers of Super Kings team. They have scored 230, 194, 138, 135, 128 and 111 runs. Imran Tahir, Deepak Chahar and Ravindra Jadeja are the top wicket-takers. They have taken 13, 10 and 7 wickets respectively. On the other hand, Sunrisers Hyderabad had a decent start this season but failed to take it forward. The middle-order was exposed and failed to contribute. They have played seven games, won three and lost four games. They are in the sixth position of the points table with six points in their pocket. They have lost their last three matches back to back. David Warner, Jonny Bairstow and Vijay Shankar are the top scorers of Sunrisers team. They have scored 400, 304 and 132 runs. Rashid Khan and Bhuvneshwar Kumar are the top wicket-takers. They have taken 6 and 5 wickets respectively. Kane Williamson, David Warner, Jonny Bairstow, Vijay Shankar, Rashid Khan, K Khaleel Ahmed and Bhuvneshwar Kumar are the key players of Sunrisers Hyderabad Team. Kane Williamson will lead the SRH team. Yusuf Pathan may replace Ricky Bhui and Siddharth Kaul may replace Sandeep Sharma. Rashid Khan, K Khaleel Ahmed and Bhuvneshwar Kumar will lead the bowling department. Abhishek Sharma will play as a key all-rounder. David Warner, Jonny Bairstow are the most valuable players of the Hyderabad team. Batsmen: Kane Williamson, David Warner, Yusuf Pathan, Deepak Hooda, Vijay Shankar. Bowlers: Bhuvneshwar Kumar, Rashid Khan, Khaleel Ahmed, Siddharth Kaul/Sandeep Sharma. Kane Williamson(c), David Warner, T Natarajan, Yusuf Pathan, Jonny Bairstow(w), Shakib Al Hasan, Ricky Bhui, Shreevats Goswami, Wriddhiman Saha, Vijay Shankar, Shahbaz Nadeem, Deepak Hooda, Mohammad Nabi, Abhishek Sharma, Sandeep Sharma, Rashid Khan, Martin Guptill, Bhuvneshwar Kumar, Siddarth Kaul, K Khaleel Ahmed, Basil Thampi, Manish Pandey, Billy Stanlake. MS Dhoni, Suresh Raina, Ambati Rayudu, Kedar Jadhav, Shane Watson, Faf du Plessis, Imran Tahir, Deepak Chahar and Ravindra Jadeja are the key players of Chennai Super Kings Team. The Super Kings team management may play with the same playing 11. Ravindra Jadeja and Mitchell Santner will play as a key all-rounder. Faf du Plessis and Suresh Raina are the most valuable players of Chennai Team. Batsmen: Faf du Plessis, Shane Watson, Ambati Rayudu, Suresh Raina, Kedar Jadhav. All-Rounders: Ravindra Jadeja, Mitchell Santner. Bowlers: Shardul Thakur, Deepak Chahar, Imran Tahir. MS Dhoni(w/c), Shane Watson, Imran Tahir, Faf du Plessis, Chaitanya Bishnoi, Suresh Raina, Mohit Sharma, Ambati Rayudu, Mitchell Santner, Monu Kumar, Kedar Jadhav, Harbhajan Singh, Ravindra Jadeja, Sam Billings, Deepak Chahar, Dhruv Shorey, Ruturaj Gaikwad, Shardul Thakur, Scott Kuggeleijn, Murali Vijay, Dwayne Bravo, KM Asif, N Jagadeesan, Karn Sharma. The pitch of Rajiv Gandhi International Stadium, Hyderabad is good for batting and also favours the fast bowlers. Dream11 Fantasy Cricket Tips: Try to take top order batsmen and fast bowlers in your teams. Rain is predicted in the morning. The weather of Hyderabad is forecasted to be mostly cloudy at the time of the match. The temperature is expected to be 33-Degree Celsius and the humidity to be 38%. Jonny Bairstow: 304 runs in seven innings. David Warner: 400 runs in seven innings. Kane Williamson: 17 runs in two innings. Shane Watson: 111 runs in eight matches. Faf du Plessis: 128 runs in four games. Kedar Jadhav: 135 runs in seven innings. Abhishek Sharma: 2 runs and one wicket in one game. K Khaleel Ahmed: 3 wickets. According to crix11 astrology match prediction, SRH will win today. CSK will win the toss and opt to bowl first. You may like to read dream11 prediction.